The Old Post Office is a much-loved family home situated at the heart of the charming village of Stackpole (award-winning pub food at the Stackpole Arms). Stackpole lies within the National Park and borders the National Trust managed Stackpole Estate and is within walking distance of the Pembrokeshire Coast Path. The cottage is comfortably furnished for all ages with the best of the old, combined with modern conveniences, providing plenty of living space both inside and out. Its light and airy interior and outdoor eating areas make it a perfect summer house whilst feather quilts, welsh blankets and a wood-burning stove make it cosy in the winter too. The Old Post Office has a large garden with a flat lawn area, perfect for ball games (football posts discreetly positioned) with a somewhat overgrown area surrounding it providing privacy and enclosure. A circular walk from the cottage, by way of a permissive pathacross farm land to the spectacular golden sandy beach of Barafundle, can lead you either to Stackpole Quay (NT Tea Room) or across the cliffs by way of the coastal path to the equally stunning Broad Haven South beach returning through the beautiful eighteenth century Lily Ponds to Stackpole Village or Bosherston. The Lily Ponds are easily accessed on foot from the village whilst a ten minute car journey will take you to the naturally awe inspiring beach at Freshwater West - film fans will recognise it from Harry Potter; Robin Hood and more recently Their Finest and surf fans will know it for its waves. Aside from the natural beauties in close proximity to the cottage there are a number of attractions in nearby Narberth; Pembroke; Carew and Tenby which include castles; water parks and boat trips. Over the ten+ years that we have rented it out we have had many returners who, like us, also consider the place a ‘second home’. En suite bathroom to bedroom 1 with bath, wc and basin Shower room with wc and basin. Downstairs wc. Dining Room: leading from kitchen area with French doors onto garden, seating for 8+ Sitting Room: three comfortable sofas, wood-burning stove, TV/DVD and video - plenty of family videos available, French doors onto garden. Gas hob and electric oven, two fridges and one freezer, microwave, dishwasher, plenty of crockery, cookery books and equipment. Washing machine and dryer. Notes on accommodation: Central-heated throughout. Outside: Large lawned garden with football posts and sandpit. Herb and shrub garden with outdoor seating area. Safe parking for three cars. Utility Room: Boot Room with pegs, shoe racks, log baskets and assorted indoor and outdoor toys. Cleaning / Towels / Linen / Maid service: All bedlinen included, changed weekly. Towels not included. Absolutely stunning cottage, set in an idyllic location near to beautiful beaches. Cottage has everything you could want. Enjoyed a lovely girls' weekend doing lots of walking and eating lots of nice food and then relaxing beside the wood burning stove. Everyone we spoke to in the village was very friendly especially the staff at the Stackpole Inn. We would all definitely recommend this cottage and would love to come back time and time again. What a beautiful cottage in a great location. It's spacious interior and huge garden makes it the perfect place for a family holiday. It was also nice to be cut off from mobile phone and internet connection. There are so many beautiful beaches within a short drive and the best one is just a stroll through the fields. We will definitely be returning! Have stayed here several times,love it!Ideal location can walk to a fantastic beach. 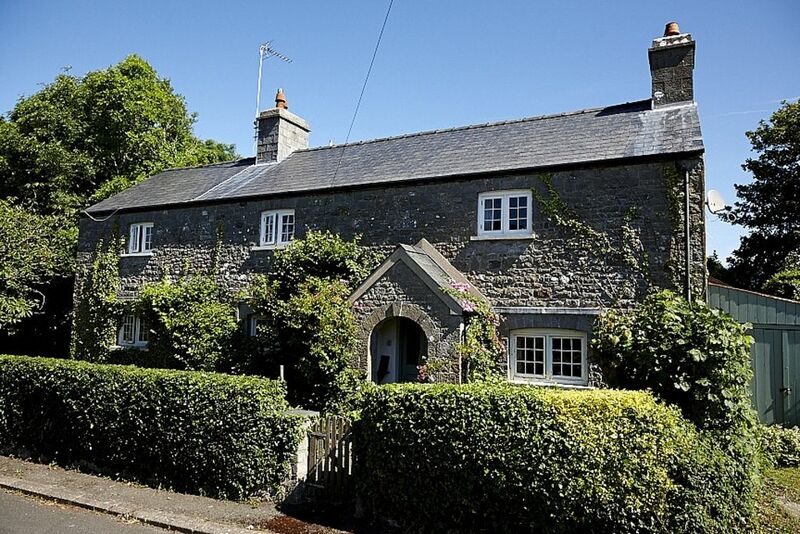 Cottage full of character and well equipped.Could happily move in permanently! Maison parfaite pour une grande famille. Confort, chaleur et propreté. Nombreux jeux pour petits et grands. Nous avons eu l’impression d’arriver dans la maison de famille. Village très beau. Merci à la propriétaire pour sa compréhension quant aux horaires à modifier. Réponse rapide aux questions et explications très claires pour atteindre la maison. Barafundle Beach, sandy - 25 mins walking. Stackpole Quay (NT Car Park for Barafundle Beach) 5 mins drive, 10 mins walk, then easy walk on coastal path to Barafundle. Broad Haven South Beach, sandy - 45 mins walk through Lily Ponds, 10 mins drive to NT Car Park with steps down to beach. Freshwater East Beach, sandy - 10 mins drive - level access from car park. Freshwater West Beach, sandy and pebbles, great rock-pools - surfing and sunsets - 15 mins drive. Pembroke shopping for both the essentials and the frivolous - farmers market, country stores, bookshop, antiques, surf shops and cafes. Narberth, specialist food shops including delis, bakeries and sweet shop and galleries and gift shops. Lots of outdoor activities, riding, surf schools, coasteering and all sorts of watersports provided by professional companies with all equipment to rent. 15 minutes to Oakwood, The biggest theme park in Wales and Folly Farm for the younger children! Changeover Day: Friday, arrival after 4pm and departure before 10.30. Notes on prices: Prices are for the property per week in UK Pounds.